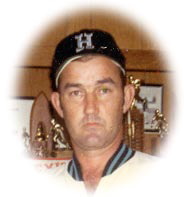 Walter Fred Wolff, was born December 22, 1932 in Burton, TX and passed away June 7, 2004 in Houston, TX. He was raised in Bellaire, TX where he played basketball and softball, was a graduate of Lamar High School, and attended the University of Houston. Walter ran his own carpenter contracting firm, Walter F. Wolff Construction Co., which sponsored a number of Bellaire youth sports teams through the years. In his prime, Walter was one of the best fast-pitch softball pitchers in the state of Texas, and competed in a number of world softball tournaments and even played internationally in Mexico and New Zealand. His many softball accomplishments are chronicled at www.walterwolff.com. Walter was preceded in death by his parents, Helmuth and Ella Wolff; his brothers, Harry Walter Wolff and Helmuth (Bookie) Wolff; and his sister, Betty Dodd. He is survived by his wife, Nora Wolff; his sons, Gary Wolff and Walter F. Wolff, Jr.; his daughter, Christy Waybright; his 6 grandchildren, Melissa Gilliam, Bridget Wolff, Heather Wolff, Bryan Wolff, Hansel Wolff, and Zoe Waybright; and his sister, Anabelle King. The family will receive friends from 6:00 until 8:00 p.m. Thursday, June 10, 2004 at Earthman Bellaire Chapel, 6700 Ferris. A Funeral Service will be held at 10:00 a.m. Friday, June 11, 2004 at the funeral home. In lieu of flowers, the family suggests memorials be directed in the name of Walter F. Wolff either to the American Stroke Association at 7272 Greenville Avenue, Dallas, TX 75231, www.strokeassociation-donate.org or to Burton Cemetery Association, P.O. Box 385, Burton, TX 77835.